The Celtics lost their fifth straight game against the Thunder 119-104. 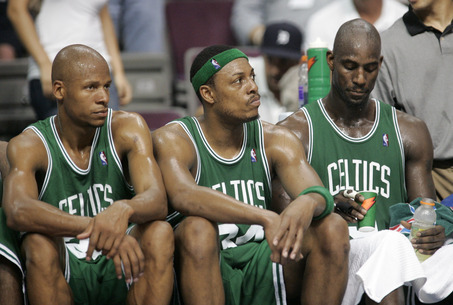 It was always going to be a struggle as the Celtics were missing Rondo (suspension), Jermaine O’Neal (Wrist), Chris Wilcox (Right Abductor), and Brandon Bass (Knee). This led to a shift in the lineup of Paul Pierce to the 4 position and Kevin Garnett to the 5. The Celtics started out well in their new lineup jumping out to a 22-12 lead in the first quarter. The Celtics could not hold the lead though, and once the second unit came onto the floor, the Thunder pounced and went on a 30-3 run. The Thunder continued the hot streak and put up the most points in a half all season (72). James Harden was constantly exposing the Celtics defense as he kept blowing by for easy layups. Pierce actually had one of his better games of the season, by attacking the rim he got to the line 16 times, scored 23 points, and had 8 assists. Kevin Garnett in his first game back had 23 points on 8-11 shooting. Turnovers still hurt the Celtics as they committed 18 in the game. Doc ended up relying much more on his starters than he wanted to as his subs had a terrible night from the floor. Marquis Daniels was only on the court for five minutes but the Celtics were outscored by 17 during those five minutes. The Celtics mercifully have the All-Star Break coming up this week and have a full week off until their next game against the Bucks. Paul Pierce and Rajon Rondo will be playing in the All-Star Game as reserves for the Eastern Squad. Kevin Garnett came back after two games from missing due to personal reasons; Pavlovic was the only Celtics player who did not play due to Coaches decision; The Thunder had 50 points in the paint; James Harden was +23 while he was on the floor; The Celtics had 3 offensive rebounds, Kendrick Perkins had 5 on his own. Avery Bradley along with Paul Pierce was the only two players for the Celtics who had a positive +/- for the Celtics. Avery shot well again for a second consecutive game going 5-9 from the floor and 2-2 from the line. We also had two of my favorite Avery moments of the season. In the first half Avery got the ball off of a rebound, dribbled the full length of the court and posterized Kevin Durant. Later on in the game, it looked as if Russell Westbrook had a clear path to the bucket but was tapped by Bradley off the backboard and forced a jump ball. Avery had 5 assists and 3 blocks on the night along with his 12 points. In the games that Rondo has missed, Avery has shown Doc that he is a capable backup and definitely a player that the Celtics should be excited about in the future. This entry was posted in Celtics and tagged avery bradley, Avery Bradley Alert, boston celtics, Doc Rivers, ESPN Top TEn, kendrick perkins, Kevin Durant, kg, oklahoma city thunder, rajon rondo, Russell Westbrook by leibo4. Bookmark the permalink.